Heather Wardell, Women's Fiction: "Polar Bear" is running free! "Polar Bear" is running free! 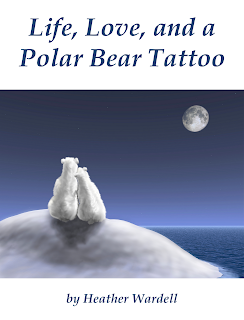 Now that I have moved on to other books, I have decided to make "Life, Love, and a Polar Bear Tattoo" available for free download. The files themselves contain a brief licensing note, but basically, there are only two things you cannot do with this book: print it in a way that makes it look like a book or make money from it. On my web site, you can see an excerpt and get the entire book for free. It's available in PDF format as well as Mobipocket/Kindle format, and also available to read or download at Scribd. If there's another format you'd like to see, let me know and I'll see what I can do. Please feel free to spread the word about this free commercial women's fiction novel - I'd love to have lots of people download and read it! And of course, I'd love your comments after you've read it! If you'd like, you're welcome to 'steal' the following description for your posting. When Candice's in-laws were killed eight months ago buying a huge faux polar bear rug for her Christmas present, she lost more than just two of her favorite people: she lost her husband Ian as well. After only two years of marriage, their guilt and pain have left them living together but apart, unable to really talk for fear of what they'll say to each other. Ian leaves for a month-long contract overseas, and Candice plans to use the time apart to decide whether her marriage can be saved. When her ex walks back into her life as the new client at work, ten years more attractive yet saddened by his own recent loss, she's left wondering what she really wants from life and love. How cool! I hope you get a lot of feedback on your novel! December 31, 2008 at 1:47 p.m.
Nathan B. tipped me off - looking forward to reading! January 9, 2009 at 7:46 p.m. Thanks so much, 'other lisa', and I hope you enjoy it. Thanks to you too, Riohnna! January 9, 2009 at 8:08 p.m.
Good for you, Heather. I'm very much in favor of free novels. I've been serializing my own novel, Servicing the Pole at my web site for a few months now with excellent results. If you'd like to write to me and discuss traffic, strategy, or anything else having to do with a free book, you're more than welcome to do so. January 10, 2009 at 8:41 a.m.
Downloaded in an instant - layout good, it scales well to A4 standard European format too - so it's now in Germany, without any shipping costs - awesome! Let you know how I get on with it - thanks for sharing. January 10, 2009 at 3:15 p.m.